WROsound is an urban festival in Wrocław, which is now experiencing its second youth. 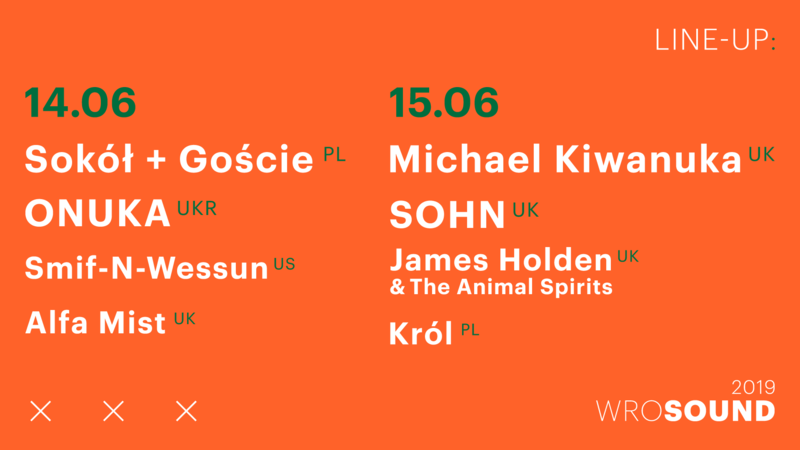 Over the years, it has been carrying out a programme featuring — in line with the name of the event — artists responsible for the sound of Wrocław. After some time, the formula was further expanded to include concerts by foreign musicians, but the local patriotism remained a staple of the event — every year, the mantle of curator is taken over by a different figure from the world of Wrocław music (2017 — Marcin Cichy from the Skalpel duo, 2018 — EABS musicians). In 2018 the festival underwent a ground-breaking change of image, replacing winter with summer, and the indoors with the outdoors. We celebrated the 10th anniversary of the festival — announced as #backyard — with EABS and PRO8L3M, among other artists, and the outdoor stage was built in an inconspicuous and atmospheric backyard hidden behind Impart. This year’s edition goes one step further, aims higher and is still pretty much evolving. It boldly goes out to the front from the backyard hidden among garage units in order to create a brand-new space. The stage is expanded, the line-up gets longer, the infrastructure gets built. What never changed is the ambition to build an event with a place for Polish rap, Ukrainian electro-folk, jazz experiments and songwriters with a setlist full of hits. And, of course, the conviction that a Polish artist can become one of the headliners, even among international guests, and not feel worse because of it. Tickets available via wrosound.com, strefakultury.pl, eventim.pl, empikbilety.pl, Going. Stationary – at the ticket offices of the Culture Zone Wrocław and Empik sales outlets.